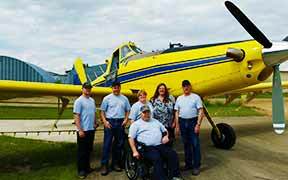 About Wetaskiwin Aerial Applicators Ltd.
Our story begins in 1981 with owners Brent Lange and Larry McDonald. In 2000 Larry left the business to pursue other interests. In 2014 Corey Lange came on as manager and pilot, joining Jenny Flynn (nee Lange) who came on fulltime in 2013 managing the office and helping with ground crew. Marinda Strydom has been with us 18 years in the office and Bruce Gair has been piloting with us for over 30 years!